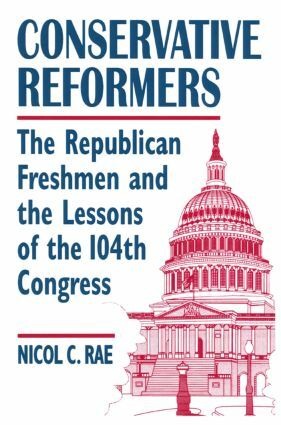 Nicol Rae's engaging account of the Republican revolutionaries' freshman year in Congress persuasively demonstrates that the precepts set forth by Madison in Federalist 10 and 51 are still in force in our remarkably stable political system. The 73 Republican freshmen who entered the House of Representatives after the 1994 election were a well-organized group with majority status and a commitment to change. This book examines the extent to which they were successful in redirecting policy and reforming the institutions of representative government -- and the extent to which those same institutions moderated, and even frustrated, efforts to introduce radical, rapid -- indeed revolutionary -- change. Contrasts are drawn both with the role of the Republican freshmen in the Senate and with the power of the President as manifested in the 1995-96 budget battle. The book is based on interviews conducted by the author when he was an APSA Congressional Fellow in the offices of Rep. George P. Radanovich, president of the freshman Republican class, and Sen. Thad Cochran, chairman of the Senate Republican Conference.